After leading the Colorado Avalanche to the National Hockey League playoffs in his first season as the team's head coach, former Terrier Joe Sacco has been named a finalist for this year's Jack Adams Award, given annually to the NHL's Coach of the Year. 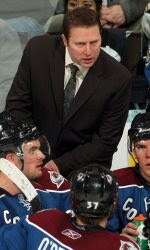 Last June, Sacco was named the Avalanche's head coach after a 2008-09 season that saw the team finish in last place in the Western Conference. Sacco orchestrated a 26-point turnaround, as this year's squad posted a 43-30-9 record, good for 95 points and an eighth-place finish. Sacco and the Avalanche faced the top-seeded San Jose Sharks in the first round and won two of the first three contests in the best-of-seven series before falling in six games. The other two finalists for this year's Jack Adams Award are Barry Trotz of the Nashville Predators and Dave Tippett of the Phoenix Coyotes. He was our best defenseman. He's self motivated. He shows up every day for practice and does everything you ask him, pays attention at all the meetings. If he was a little bit older and getting paid to play I would tell you he's a pro. That's the way he conducts himself. Seven former Terriers who were competing in the Stanley Cup playoffs had their seasons end when they were eliminated in opening round series. For Tom Poti (Washington), Mike Grier (Buffalo), Jay Pandolfo (New Jersey), Colin Wilson (Nashville) Adrian Aucoin (Phoenix), and Brandon Yip and Coach Joe Sacco (Colorado), it’s wait ‘til next year. There is one player call-up from the AHL. Former Hockey East MVP and All-American goalie John Curry, however, has joined the Pittsburgh Penguins for the second round, now that the Wilkes Barre Penguins were eliminated in Calder Cup play. He most likely would only play in case of an injury. Also moving up to the big club is Baby Pens' assistant John Hynes, a former BU forward and coach of the U.S. National Development Team Program. Also skating on is 2010 recruit Sahir Gill (photo), whose Vernon Vipers won the Doyle Cup in seven games, defeating Spruce Grove. Vernon joins the five-team field for the RBC Cup, Canada’s Junior A Championship. Vipers are defending RBC Cup champs. Gill has a 6-9-15 line in 19 playoff games, skating on the Vipers top line. 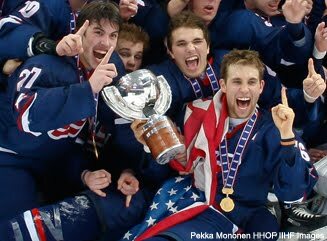 2010 recruits Adam Clendening and Matt Nieto concluded their NTDP careers with their second World U18 championships gold medals, as Team USA defeated Sweden, 3-1, to win this year’s title game in Belarus. Team USA outscored its opponents 33-7 in the seven games. Clendening (photo) assisted on the third goal and finished the tournament with 10 points, tied for best on the team. He was the tournament’s top-scoring defensemen and had the best plus/minus, +7. Clendening was one of two U.S. players named to the all-tournament team and also was named one of Team USA’s three best players. Nieto had a 1-3-4 line in the tournament. Mike Grier. The pride of Boston University and St. Sebastian’s has been one of Buffalo’s best players throughout the series, and he had another beauty of a game for Buffalo. Three shots on net, five hits, three blocked shots, a goal scored and a plus-1 during an eventful night. Grier was also drilled in the back of the head with a Dennis Wideman shot he stepped in front of in the third period, but returned later in the game after hitting the dressing room briefly. Tough, intelligent, experienced and skilled enough to skill get the job done, Grier is one tough mammer jammer. The title of NCAA champion remains on Commonwealth Avenue for a third straight year, with BC succeeding the 2009 Terriers, who in turn, succeeded the 2008 Eagles. Inside Hockey’s Scott Martineau offers one man’s opinion of how a “dream matchup” between this season’s BC squad and last year’s BU team would shake out. Who do you think would come out on top? Team USA meets Sweden at Noon today Eastern Time in the World U18 gold-medal game. Live updates. Former BU blueliner Brian Strait’s rookie season in the AHL came to an end as Wilkes Barre was eliminated in the first round of the Calder Cup Playoffs. In 78 games, Strait had a 2-12-14 line with 73 penalty minutes and a team-best +22. 2010 recruits Adam Clendening and Matt Nieto (photo) each scored a second-period goal and Nieto added an assist as Team USA blanked Finland, 5-0, in the semifinal of the World U18 Championships in Belarus. The victory marked the U.S. team's third shutout in the past four games and its fifth win in six game. USA will have the opportunity to defend the title it won in 2009 in Friday's gold-medal game against Sweden, the only team to beat Team USA in the tournament. Campbell helped his own cause in the second stanza when he poked the puck to Bryan Rust (Bloomfield Hills, Mich.), who sent a long pass to a streaking Matthew Nieto (Long Beach, Calif.). Nieto then sped around a defender and flipped a backhanded shot inside the left post to make it 3-0 at 6:19. Team USA received a four-goal cushion with just one second remaining in the middle period after Shore found a wide-open Adam Clendening (Niagara Falls, N.Y.), who wired a shot into the upper-right corner of the net. Clendening's goal, his third of the tournament, tied him for the team lead in scoring with 9 points and also in plus-minus with +9 for the six games. Nieto's goal was his first of the tournament. He has a 1-3-4 line. Both Clendening and Nieto were members of the 2009 U.S. that took the U18 title in Fargo. 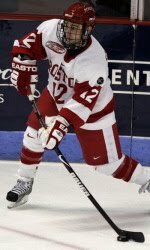 2010 recruit Patrick MacGregor talked with CollegeHockey247.com 's Jeff Arnold about his development as a defenseman at Avon Old Farms and his decision to play for BU. 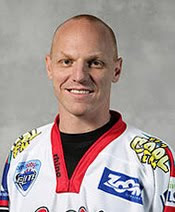 Steve Thornton, MVP of the Terriers’ 1994-95 national championship team, has ended his professional career after 15 seasons. Thornton, who scored 144 points during his BU career, played one season with Peoria in the IHL and spent the next 14 years in Europe, primarily in the UK. The past two seasons, he’s been player-head coach of the Belfast Giants. Thornton finished his pro career the same way his college career ended—with a title—as Belfast won the Playoff Championship of the British Elite League. His Terrier teammate Shane Johnson also played for the Giants the past few seasons. A dual citizen of Canada and the U.K., Thornton is returning to Ontario and has taken a position outside of hockey near Ottawa. 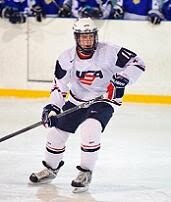 2010 recruit Adam Clendening scored his second goal of the World U18 Championships and added an assist in Team USA's 7-1 win over host Belarus. With six points, Clendening is the leading scorer for Team USA who faces the Czech Repubilc tomorrow in the tournament quarterfinals. 2010 recruit Sahir Gill scored his seventh post-season goal in Vernon’s 3-2 OT win over Spruce Grove in game three of the Doyle Cup series. BCHL champ Vipers lead the Saints 2 games to 1. Gill’s goal gave Vernon a 2-1 lead and appeared to be the game-winner until a late Spruce Grove goal tied the game. More details and Coach Parker's comments from The Boston Hockey Blog and WTBU. Matt Gilroy, captain of the 2009 National Championship team and winner of that season's Hobey Baker Award, has been named to the roster of Team USA for the IIHF World Championships to be played in Germany next month. Brandon Yip scored his first NHL playoff goal and added an assist in the Avalanche's 6-5 loss to San Jose, tying the first round series at one apiece. 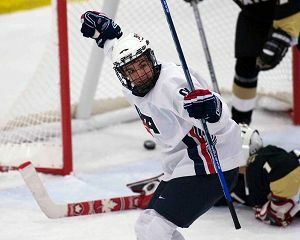 2010 recruits Adam Clendening and Matt Nieto each assisted on a goal in Team USA's 5-0 shutout of Canada in the preliminary round of the World U18 Championships being played in Belarus. Clendening leads Team USA in scoring with 1-3-4 after three games. Team USA's final preliminary round game, against the host team Belarus, is now under way. We'll report on the outcome later today. Quarterfinal play begins in Minsk on Tuesday. Both Clendening and Nieto played for the gold-medal winning U.S. squad in last year's tournament. 2010 recruit Sahir Gill assisted on two goals as BCHL champion Vernon Vipers edged their AJHL counterparts Spruce Grove, 3-2, in Doyle Cup competition. Series is tied at 1-1. 2011 recruit Cason Hohmann's season ended last week as Cedar Rapids was eliminated in the first round of USHL playoffs. Hohmann scored two goals in the five-game series with Indiana, including one game-winner. During the regular season, Hohmann scored nine goals and 27 assists in 58 games for the Roughriders. 2010 recruit Adam Clendening spoke with the Buffalo News about participating in the World U18 Championships and some of his goals when he suits up at Boston University next season. Clendening racked up four assists in Team USA's exhibition game win over Belarus. But Team USA got off to a rocky start in the preliminary round, losing to Sweden, 4-2, yesterday. 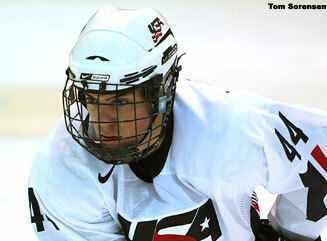 Fellow 2010 recruit Matt Nieto assisted on Team USA's first goal. Next up is Switzerland today. Both Nieto and Clendening played for the American squad that won the gold medal at last year's U18 title in Fargo. UPDATE-Clendening scored a goal and assisted on two others to lead the U.S. past Switzerland, 5-1, on the second day of preliminary round play. 2010 recruit Sahir Gill scored the game-winner for the Vernon Vipers in their 2-1 win over Powell River in the seventh game of the BCHL Fred Page Cup playoffs. The Vipers, seeking to return to the RBC Cup Championships, which they won last year, next take on the AJHL champions, Spruce Grove. Gill has scored 15 points in 19 post-season games. Colby Cohen, who signed a pro contract with the Colorado Avalanche last week, has been named to the ACHA's Reebok Divison One All-American Team. Cohen, who also was a first-team Hockey East All-Star, finished the season with 30 points and was second on the team in goal-scoring with 14. BU now has had at least one first team All-American in each of the past five seasons. Cohen is the fourth Terrier first-team All-American in the decade, joining Matt Gilroy, Dan Spang and Freddy Meyer. For a full list of Terrier All-Americans, click here and scroll to page 116. Thursday was a good day for Terriers' 2010 recruit Charlie Coyle. During the second intermission of the Boston-Buffalo game at TD Garden, Coyle was named the 2010 male recipient of The John Carlton Memorial Award, which is named for the late Bruins scout and administrator who passed away in 1982. The award is given annually by the Boston Bruins to an outstanding male and female student-athlete in an Eastern Massachusetts High School or Junior hockey who combine exceptional hockey skills with academic excellence. Coyle received his award from former Bruins standout and Vice President Cam Neely. team in Slovakia and at the Four Nations tournament in Finland. He is also an outstanding student at Weymouth High School, and will be attending Boston University next year. NHL Central Scouting announced its final rankings for the 2010 draft and Coyle was ranked #24 among North American skaters. 2011 recruit Yasin Cissé, who missed much of his USHL season with an ankle injury, was #107. Chris Drury's 14th goal helped the Rangers keep their playoff hopes alive in a 4-3 win against Philadelphia. Eric Gryba scored his first professional goal last night in the Binghamton Senator's 6-5 win again Adirondeck. Kevin Shattenkirk and Colby Cohen made their pro debuts tonight in Lake Erie's 5-4 shootout win over Abbotsford. With the Monsters trailing, 4-2, late in the third, Shattenkirk assisted on goal to narrow the deficit. Then Zach Cohen assisted on the tying goal (with 17 seconds left, no less). No goals in OT, but Shattenkirk had one of the shootout goals for the Monsters. Colby got on the scoresheet with his first pro fight. Shattenkirk took 5 shots, Colby 3. Former Terrier David VanderGulik had two assists for the Heat. DailyFree Press talked with Coach Jack Parker about next season and the roles that returnees are likely to play. 2010 recruit Sahir Gill scored the game-winner and added an assist in Vernon's 4-2 win over Powell River, tying the BCHL final series at two games apiece. Gill has 13 points in 16 playoff games to date, third best on the Vipers. NHL Central Scouting has posted its final rankings for the June draft. Among North American skaters, 2010 recruit Charlie Coyle is ranked #24, while 2011 recruit Yasin Cisse, who missed most of the season with an injury, was ranked #107. 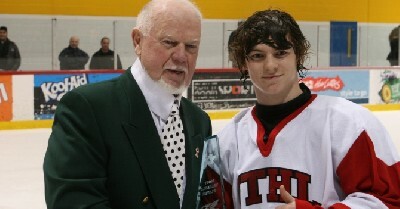 A blog reader forwarded the information that 2012 recruit Robert Polesello was named co-MVP of the Greater Toronto Hockey League Top Prospects game, featuring the top 15 year olds in Toronto. Earlier in the season, Polesello was co-scoring leader in the Toronto Marlboros International Holiday Classic with 7 goals and 7 assists 8 games as he led the Jr. Canadians swept to the tournament title. Let's Play Hockey reports that nearly one-third of NHL players are products of college hockey--including 13 ex-Terriers, tied with BC for third most after Michigan and Wisconsin. For a full list of collegians in the NHL, click here. With Eric Gryba graduating and juniors Kevin Shattenkirk and Colby Cohen foregoing their senior seasons to sign with Colorado, BU has lost half its starting blueline corps. BU’s coaching staff has added a defenseman with size to fill one of the slots, Avon Old Farm's blueliner Patrick MacGregor, a 6-4, 210 right-shot. USHR reports that MacGregor, a 7-12-90 birthdate, has "size, strength, and the ability to both clear out in front and get the puck out of his end efficiently. He improved significantly in his senior season. " In the Winged Beavers' run to the 2010 New England Prep championship, he scored 3 goals and 18 assists, including two assists in the 4-1 title game win over Northfield Mount Hermon. Like his new BU teammates, MacGregor has played an outdoor game at Fenway Park, as Avon Old Farms took on Taft on Dec. 21 in the historic ballpark. He also played in the Western New England Fall Prep Elite Hockey League last fall. 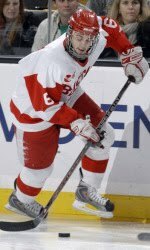 Prior to spending two seasons at AOF, MacGregor was an all-state defenseman for Hamden H.S. in Connecticut. He joins NTDP U18 defenseman Adam Clendening, who committed in BU last September, in the Terriers' 2010 recruit class, along with forwards Charlie Coyle, Sahir Gill and Matt Nieto. A year after the slogan "Burn the Boats" guided them to a national championship, two more Terriers are heeding the advice of newspaper editor Horace Greeley more than 150 years ago, "Go West, young man." Junior defensemen Kevin Shattenkirk (photo) and Colby Cohen have both signed entry level contracts with the Colorado Avalanche. Both will join the Avs' AHL affiliate, the Lake Erie Monsters where Zach Cohen has already begun his pro career and where they'll be reunited with Head Coach David Quinn, who recruited both blueliners and coached them for two seasons at BU. Denver Post coverage. Classmate Nick Bonino also headed West to begin his pro career in Anaheim. USCHO photographer Melissa Wade has assembled photo galleries of Shattenkirk and both Cohens, who are not related. Shattenkirk was the Avs' first round draft choice in the 2006 draft and Cohen was selected in the second round that season. The two were teammates long before their Terrier careers, playing together in Ann Arbor for the NTDP U17s and U18s and also for Travis Howe's East Coast Selects program (1, 2) where many current and future Terriers have honed their skills. Brandon Yip, who was enjoying a strong rookie season for Colorado, before injuring a shoulder, has returned to the Avs lineup and commented on his once and future teammates. Daily Free Press reporter Scott McLaughlin, writing for NESN.com produced a list of the top ten moments (with video clips) in Frozen Four history, with last April's dramatic come-from-behind victory by BU taking the top spot. BU's triple-overtime loss to Northern Michigan in the 1991 title game was rated #3. Former BU captain and Hobey Baker winner Chris Drury's 13th goal of the season helped the New York Rangers upend the Florida Panthers, 4-1, and pull into a tie for the final Eastern Conference playoff spot. Fifteen years ago today... BU nailed down its fourth NCAA championship with a convincing 6-2 win over conference rival Maine at the Providence Civic Center, which also was the site of BU’s 1978 national title. The Terriers had played Maine three times previously during the season, losing once and tying twice. But on this day, the result was far different. Steve Thornton, later voted team MVP, got things going late in the first period scoring from a faceoff to the left of Maine’s Blair Allison. BU stretched the lead to 3-0 on second period goals by Chris O’Sullivan and Captain Jacques Joubert, before Tim Lovell got Maine on the board. The Black Bears cut the lead to one in the first minute of the third period on Trevor Roenick’s power play goal. But BU put the game out of reach with O’Sullivan’s second goal and scores by Mike Sylvia and Bob Lachance. Tom Noble stopped 21 Black Bear shots, while Allison had 33 saves. O’Sullivan, a second team All-American, was chosen the game’s Most Outstanding Player. He was named to the all-tournament team along with Shawn Bates and Kaj Linna. BU finished the season with ten consecutive wins and 15 victories in its final 16 games. ► Sports Illustrated coverage link. Joubert, who transferred to BU after a year at Princeton, will be inducted into the BU Athletics Hall of Fame next month. Of the members of the 1994-95 team, three are currently playing in the NHL: Chris Drury (Rangers), Mike Grier (Sabres) and Jay Pandolfo (Devils). Thornton and Shane Johnson are with the Belfast Giants in the EIHL and Bates was in the AHL with Manchester earlier this season. Former Terrier captain and Olympic captain Mike Eruzione was in Omaha for a fundraiser at the University of Nebraska-Omaha and answered questions about Olympics past and present. Eruzione is a part-owner of the USHL Omaha Lancers. 2011 recruit Cason Hohmann scored his ninth goal of the season in Cedar Rapids' 5-0 win over Fargo last night. Hohmann has 34 points in 56 games as a USHL rookie.